There will be 4 title fights in the Upcoming URCC 30 on August 12th. Chris Hoffman, Fritz Biagtan, Do Gyeom and Derrick Easterling will defend their titles in Araneta Coliseum. Chris Hoffman is scheduled to defend his Middleweight title against the Canadian fighter Robert Sothman. Hoffman has a record of 5W-1L while the Canadian will be fighting in URCC for the first time with his record of 3W-4L. 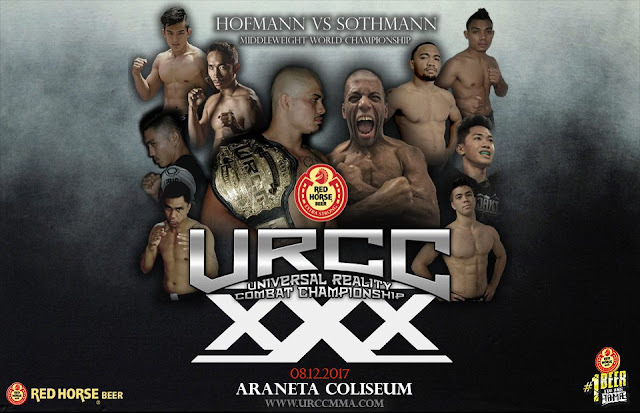 URCC strawweight undefeated champion Fritz "Kid Tornado" Biagtan 3W-0L takes on Solomon Dultra who has a record of 3W-1L, all of his wins are by way of submissions. Derrick Easterling (6W-3L) will defend his URCC Flyweight title against Jiar Castillo (2W-1L). Derrick Easterling defeats Mefi Monterroso in his last fight via submission while Jiar Castillo defeated the former URCC contender Alvin Ramirez via KO last April. URCC Featherweight World Champion from South Korea Do Gyeom Lee will defend his featherweight title against the Filipino Jojo Orao. This event will be held at Smart Araneta Coliseum.